In the winter of 2015/16, Compassion in World Farming visited farms, cage-makers and slaughterhouses in France, Italy, Portugal and Greece. Our target: European quail farming. In this groundbreaking investigation – a ‘first of its kind’ international exposé – we’ve lifted the lid on an industry that cages millions of animals every year, creating enormous suffering, yet markets its products as 'luxury'. Please take a moment to watch our short film, and call on the European Commission to End the Cage Age for quail. 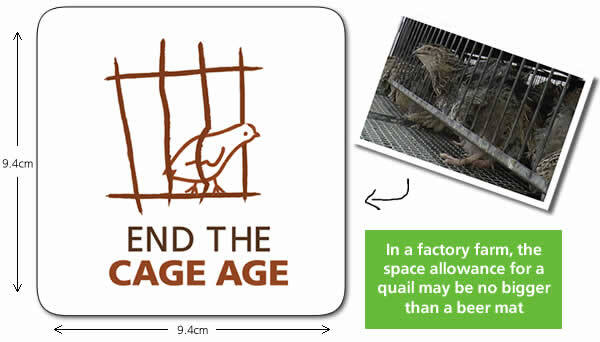 Email Commissioner Andriukaitis this message calling for an end to the cage age for quail. Each year in Europe, over 140 million quail are farmed for meat, confined to factory farm floors or densely packed in cages. They often try to leap in these cages and invariably hit their heads on the cage roof. 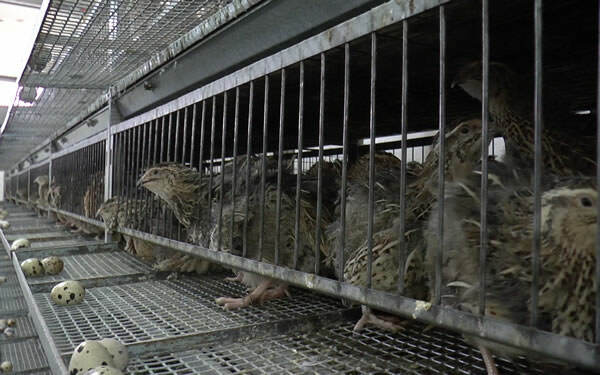 Of the 400,000 quail farmed every year for their eggs, over 90% are also kept in crowded, barren cages where they are unable to express even the most basic of natural behaviours. These birds have no earth or undergrowth to explore, nowhere to dustbathe, nowhere to hide, and barely space to move. The space allowance per factory farmed quail can be no bigger than a beer mat. Quail are one of the most caged farm animal in Europe, and there is no species-specific legislation to protect them. They desperately need your help. But the good news is that there is hope. Compassion staff have visited an alternative system; an egg farm where the quail are raised in naturally lit barns with the space and freedom to explore, dustbathe, hide and peck at straw bales. This is no hobby farm, but a large commercial operation. Higher welfare quail farming is possible. Please take action now to give ALL quail a life worth living. Quail are the smallest animals to be intensively farmed, but this comes at a big price. Will you help to end this factory farming in miniature? During the winter of 2015/16, Compassion in World Farming investigated quail farming in four Member States: Italy, France, Portugal and Greece. Of these countries, three (Italy, France and Portugal) are amongst the top four EU quail producing nations. This investigation has uncovered clear evidence that the majority of quail farming in the EU is undertaken in breach of Council Directive 98/58, which requires Member States “to ensure that the owners or keepers take all reasonable steps to ensure the welfare of animals under their care and to ensure that those animals are not caused any unnecessary pain, suffering or injury”. Over 140 million quail are farmed in the EU every year, for meat and eggs. The majority of these quail are used for meat production and will spend their lives on overcrowded factory farm floors or in cramped cages. In Italy, caged meat quail may be given the space equivalent of a beer mat in which to live their pitifully short lives – a meat quail will be slaughtered at just five weeks old. For most of the 400,000+ egg-laying quail in the EU, life is even worse: over 90% will spend their entire lives in tiny barren cages. In the wild these birds are shy and prefer to stay hidden. In cages they have no space and are barely able to move around and carry out the most basic of natural behaviours. The investigation shows quail confined in tiny cages of bare wire, causing injuries and stress, and leaving them unable to express their natural behaviours. When the quail leap – a fear response that, for example, may be triggered by workers entering the barns – the cages are so small that they smash their heads on the roof of the cages. Foot injuries, such as bumblefoot, can be the result of wire mesh floors of the kind seen in these cage systems. Higher welfare systems for farming quail do exist, such as some ‘free to fly’ systems, but unfortunately almost all of the EU’s quail production is undertaken in low welfare, barren conditions. Sadly, this investigation reveals just how far Europe’s quail farmers have to go to meet acceptable standards. It is unlikely that very poor welfare in the farming of quail is confined solely to those farms or Member States visited; the conditions uncovered are likely to be the norm across all EU member states in which quail farming is undertaken. I urge you to End the Cage Age for Europe’s quail by introducing species specific legislation that addresses the welfare needs of quail and prohibits the caged farming of these birds. You can find more information on this issue by viewing the investigation here.